I’m 15 and have been riding for 11 years. I just bought a Halflinger pony that stands at 14.2. He’s a pleasure to own but rests his head on the reins and often pulls. I would like to find out a way to get him lighter on the reins with lighter contact—but without him zooming off when I’m schooling him. I’ve tried lots of things. One trainer recommended that I put my rein and hand up on his neck then bring it back and repeat the process on the other side. This does reduce his resting on the reins a little but it also encourages him to take off in a fast trot. Then I have to pull on the reins and feel him pulling against me again. I don’t see any point of the exercise. Please help me! Whenever I get a horse with a training problem, the first thing I try to discover is what is the origin of the behavior? In other words, why is he doing this? Typically, horses that root the reins and throw their heads have learned to do that in response to tight, relentless and meaningless contact on the bit. 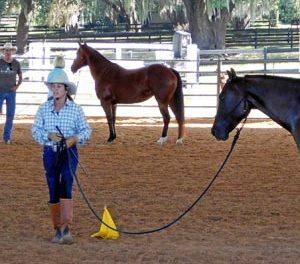 Often horses are never taught how to respond properly to the reins to begin with and contact is totally confusing to them; more often, it is because the rider is unskilled and has uneducated hands. 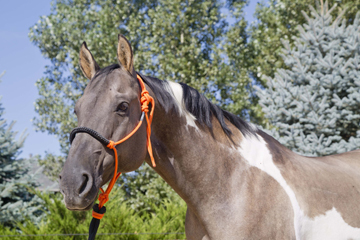 Usually fixing the cause is more effective than fixing the symptom (be wary of using artificial aids—like tie downs, martingales or draw reins– to fix bitting problems- they may only temporarily cover a symptom). He can only lean on you if you let him. Try this exercise: let a friend lean on your shoulder and notice that in order to hold her up, you will start leaning into her a little, balancing her weight. If you simply move away from her when she leans, she can’t lean on you and she will have to hold up her own weight. She can still place her hand on your shoulder to have a steady connection with you, she just can’t lean. When you feel your horse begin to lean, don’t contribute to the problem by holding him up; make him hold himself up. He should be able to trot slowly and steadily on a loose rein as well as on contact. If he zooms away, immediately check and release, using your seat and hands in a rocking, repeated motion. Don’t pull continuously; that will only make him speed up. If your horse does not maintain a steady speed at every gait, you have some holes in your training and your horse is disobedient. 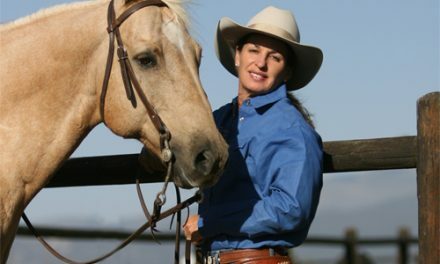 See my website for more information on how to create an obedient horse, on static vs. dynamic pressure and how to use your seat to stop the horse. Learn to use the pulley rein if you need an emergency stop. When he starts rooting on the reins, you should immediately stiffen and lock one hand on the rein so that he hits himself on one side of his mouth (it is much easier for him to lean and root on both reins than one). If every time he roots, he is successful in pulling reins out of your hand, he has gotten a reward. If every time he roots he hits a hard spot on one side of his mouth, he does not get a reward. Make sure he is rewarded with a lightening of contact when he is being a good boy. Finally, make sure when you are riding that you have some feel and softness in your hands. I like to teach “giving” hands. That means they are always stretching toward the horse’s mouth and always offering more rein when the horse softens and carries himself. Your fingers must be soft and relaxed, not tense and gripping the reins; your elbows should be very supple to act as shock absorbers for your horse’s mouth. One thing I would consider doing with this horse, is teach him to trot on a loose rein, as well as on-contact. I would put him in a trot and every time he speeds up without being asked, gently pick up ONE rein to put him into a tight turn; over-flexing his neck, bringing him to the right and then the left, alternating directions until you feel him slow down. As soon as he slows, go straight and find your way back to the rail. Rather than pulling back on two reins every time he speeds up, make him work harder when he speeds up so he learns that going fast is harder and that he will be rewarded with easier work when he slows down. Again, there is more info on my website on this subject. By the way, your horse is bred to be a puller, and that certainly doesn’t help. Draft type horses (in your case, a draft pony) have short thick necks and heavy straight shoulders in order to pull heavy loads. Although I have certainly seen Haflingers that were light and responsive, they seem to naturally want to lean on you and drag you around from the ground. 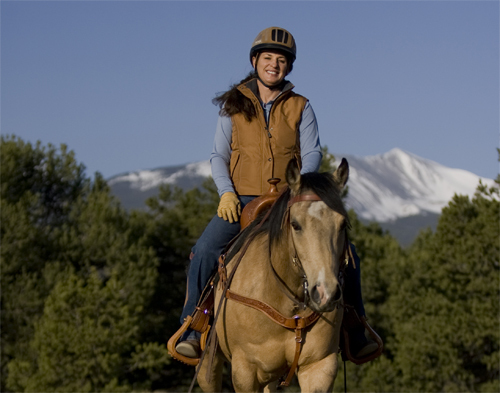 Although your horse definitely has this propensity, horses are a product of the handlers and riders that train them, for better or for worse. Hopefully you can take this information and make your horse better. In this series, master trainer and clinician Julie Goodnight discusses riding problems and solutions. 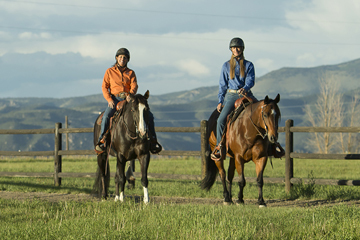 Check out Julie’s new television series, Horse Master with Julie Goodnight on RFD-TV every Wednesday at 5:30 EST. And visit her web site for more tips and a plethora of training advice.